When I hear a restaurant’s doing “Canadian” food right, they peak my interest; not only to support my national cuisine, but also to develop a deeper understanding of what it’s about. Certain items that are synonymous with Canada: tourtière, poutine and lobster are distinctly Quebecois or from the Maritimes. 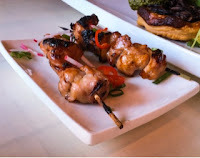 Antler’s menu incorporates numerous Ontario offerings from the large province’s forests and lakes. 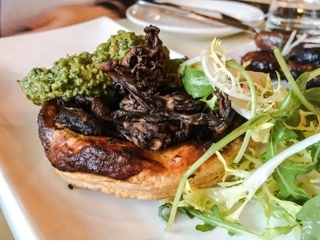 The wild mushroom tarte tatin ($10) looked beautiful, the dark foraged mushrooms lightened with a vibrant sorrel walnut pesto and frisee salad. If only the mushrooms were softer, rather than having an almost deep fried quality, to set it apart from the already flaky and crisp puff pastry. When meat is fresh and of high quality, preparing it simply is the way to go. 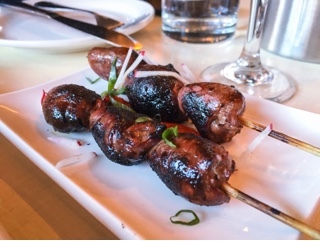 Skewers of charcoal grilled chicken thigh and duck heart ($9 for two skewers) were tasty – the chicken oh so succulent and the duck heart much lighter than expected. 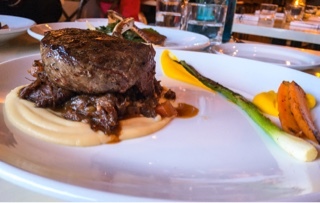 Reviews have praised Chef Hunter’s handling of venison and it’s certainly well deserved. The spice ash crusted rack of deer ($39) was fantastic, the thick chop well seared but left rare so the lean meat remained tender and moist. Sitting underneath was a hefty portion of flavourful braised pulled shoulder meat and a smooth parsnip purée: delicious even by itself. For those who are worried about the venison being gamey, it’s no stronger black angus. 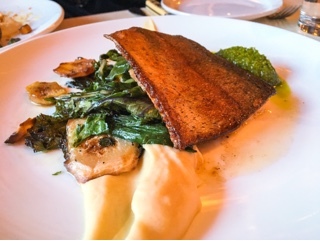 The skin on the pan seared rainbow trout ($28) was done to perfection – crackling and lightly seasoned. Despite being a thinner cut, the trout was succulent: Antler cooks fish right. To balance the other heavier dishes, the charred kale, wilted swiss chard, celery root purée and bright salsa verde were a blessing. I had my doubts about the chestnut gnocchi ($21), not being a fan of sweet mains (the dish contains brown butter and almond brittle). Yet it was scrumptious, the earthy fluffy gnocchi each having a well seared crust. 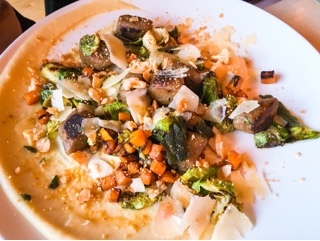 Diced roasted squash, brussel sprout leaves and shaved parmesan kept the dish savoury. The daily special, a duck duo ($35), incorporated a decently prepared duck breast – a large portion but the skin could have been further rendered. Yet, it was missing an important part to the dish: the duo. 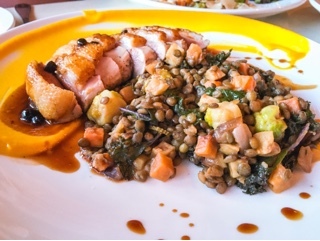 We even double checked to see how we’d expect the aforementioned leg to be served (incorporated into the lentil mixture on the side). Despite every one of us combing through it meticulously – squash … brussel sprout … lentil … kale … not an ounce of leg was found. 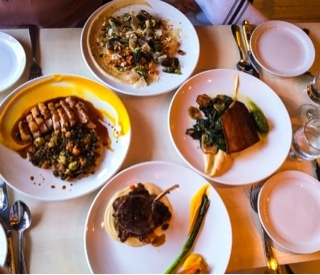 Ely, our server, was so funny and charming that I’ll begrudgingly look past the absent duck leg and incorrectly charged bottle of wine ($60 on the menu vs. $75 on the bill that wasn’t discovered until the writing of this post). Antler’s atmosphere is laid back and friendly, not unlike the Canadiana persona. I was hoping to try Canadian geese – through following Chef Hunter on Twitter realize these large waddling traffic inducing fowls are approved for hunting. Unfortunately for me (but luckily for the geese) it was out of season and not available on the winter menu. Oh, and ladies, Chef Hunter is certainly not hard on the eyes; if you’re in luck (like we were) he may just make an appearance to the front of the house.